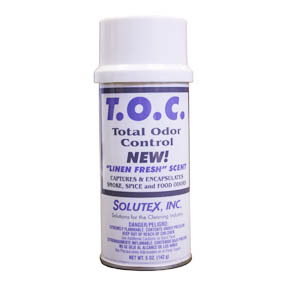 TOTAL ODOR CONTROL-FRESH LINEN FRESH LINEN 12CNS/CS 5 OZ CANS - SOLUTEX, INC.
T.O.C. is a solvent based odor counteractant that captures and encapsulates the worst smoke, spice and food odors. 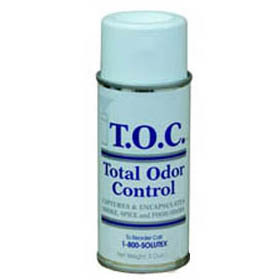 This handy odor-counteractant can be set off as a total release fogger or can be sprayed in short bursts to handle different odor scenarios. 12 cans per case.